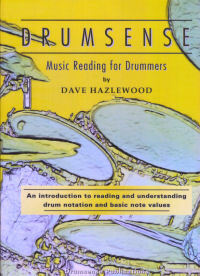 Back to product list Drumsense tutor Dave Hazlewood has written this introduction to reading drum music, which covers basic notation, note positions and note values. The book covers all common note values from whole notes to 16th note triplets, with explanations and exercises at each step along the way. Staple bound book - 38 pages.